Sometimes, you just want or need to put a radio on the air in the simplest manner possible. Perhaps you just bought a brand-new (or used, hamfest treasure) radio and want to use it NOW, not after you get a proper antenna set up. Or maybe you are in a hotel room during the Dayton Hamvention, and would like to join in the fun that is happening on the air. Or, on a less happy note, perhaps that storm that just came through not only knocked out the phone lines and cell network, but also brought down your antennas. Here's a quick and easy way to deal with it. Unknown to most persons, except lawyers and those ATF victims incarcerated in federal prisons, it is a federal crime for the following nine categories of persons to possess firearms: persons who have been convicted of a crime potentially punishable by more than a year (a bad check conviction 40 years ago can suffice), fugitives, users of drugs or marijuana, mental defectives, illegal aliens, dishonorable dischargees, renouncers of citizenship, those subject to domestic restraining orders, and those convicted of misdemeanor domestic crimes of violence (threatening your wife 20 years ago can be enough). Title 18, U.S. Code, Sections 922(g) and 924(e) mandate a penalty of up to 10 years, and in the case of persons previously convicted three or more times of drug crimes and certain others, a mandatory 15 years to life with no parole. (Someone 50 years old convicted at age 19 of, say, three pot sales, thereafter becoming a model citizen and caught with a gun hunting ducks 30 year later is an Armed Career Criminal subject to the enhanced 15 years to life.) Any person purchasing a modern handgun, rifle or shotgun from a retailer must sign an ATF Form 4473 swearing that he is not in one of these categories. Lying constitutes yet another federal crime. There are several tens of millions of Americans that fit one of the above prohibited categories. There are also over 10,000 such persons in federal prison for illegal gun possession, including over 2,000 with the enhanced 15-life penalty. Horror stories abound and I can think of two published decisions off the top of my head in which people were sentenced to 15+ years: a duck hunter caught in hip waders with duck decoys and a shotgun and a man caught with a Model 1908 Colt .25 caliber automatic pistol with no ammo, no clip, no grips, and a slide rusted closed. Muzzleloaders (so-called black powder guns loaded from the end where the bullet exits) are legal, whether original or replica, regardless of the date of manufacture. You can buy them by mail order. The most practical to own for self-defense are the so-called cap and ball revolvers originally made between 1840 and 1870 and used by Wyatt Earp and other gunslingers of the West. Numerous companies make and sell replicas of these six-shooters. Many can be had for $100 or slightly less. A good choice would be the .44 caliber Model 1860 Army. To use them you need powder, lead balls, wads, and percussion caps, all readily available in gun shops and sporting goods stores. Between 1858 and 1898 millions of cartridge firing guns were made by Smith & Wesson, Colt, Iver Johnson, Remington and numerous others in such calibers as .22, .32, .38, .44, .45 and many dozens of others. Believe it or not, these original guns (totally exempt from federal gun controls) are so abundant that they can be had for $150 or less at any of the dozens of gun shows held in this country from coast to coast on any given weekend. At nearly any gun show you can pick up a very workable .32 or .38 S & W revolver, a 12-gauge double barrel shotgun, a 7mm German Mauser bolt action military rifle, and many others for less than $150, all made prior to 1899 and legal for anyone to possess. This third antique category will not be dealt with in this article simply because this author does not know of any modern made replicas of pre-1899 cartridge firing guns that use ammunition cartridges not readily available in the ordinary channels of commercial trade. ATF claims that they have no list of guns in this category and any request for antiquity classifications of such will be dealt with on a case by case basis. "V6" redirects here. For other uses, see V6 (disambiguation). A V6 engine is a V engine with six cylinders mounted on the crankcase in two banks of three cylinders, usually set at either a right angle or an acute angle to each other, with all six pistons driving a common crankshaft. It is the second most common engine configuration in modern cars after the inline four. The V6 is one of the most compact engine configurations, shorter than the straight 4 and in many designs narrower than the V8 engine, and is well suited to the popular transverse engine front-wheel drive layout. It is becoming more common as the space allowed for engines in modern cars is reduced at the same time as power requirements increase, and has largely replaced the inline-6, which is too long to fit in many modern engine compartments. Although it is more complicated and not as smooth as the inline 6, the V6 is more compact, more rigid, and less prone to torsional vibrations in the crankshaft. The V6 engine has become widely adopted for medium-sized cars, often as an optional engine where a straight-4 is standard, or as an economy engine where a V8 is a higher-cost option. It is also becoming a high performance engine, due to its high power and torque output like the classic V8 while still maintaining great fuel economy  Some examples of this are: Nissan Z-car, Infiniti G, Chevrolet Camaro and the Hyundai Genesis Coupe all in which have at least 300 horsepower at the crank. Modern V6 engines commonly range in displacement from 2.5 to 4.3 L (150 to 260 cu in), though larger and smaller examples have been produced. From 1908-1913 the Deutz Gasmotoren Fabrik produced benzene electric trainsets (Hybrid) which used a V6 as generator-engine. Another V6-car was designed in 1918 by Leo Goosen for Buick Chief Engineer Walter L. Marr. Only one prototype Buick V6 car was built in 1918 and was long used by the Marr family. The first series production V6 was introduced by Lancia in 1950 with the Lancia Aurelia. Other manufacturers took note and soon other V6 engines were in use. In 1959, GM introduced a heavy duty 305 cubic inch (5 L) 60-degree V6 for use in their pickup trucks and Suburbans, an engine design that was later enlarged to 478 cubic inches (7.8 L) for heavy truck and bus use. 1962 saw the introduction of the Buick Special, which offered a 90 degree V6 with uneven firing intervals that shared some parts commonality with a small Buick V8 of the period. Consequently the Buick Special met consumer resistance due to its excessive vibration. In 1983 Nissan produced Japan's first V6 engine with the VG series. Due to the odd number of cylinders in each bank, V6 designs are inherently unbalanced, regardless of their V-angle. All straight engines with an odd number of cylinders suffer from primary dynamic imbalance, which causes an end-to-end rocking motion. Each cylinder bank in a V6 has an odd number of pistons, so the V6 also suffers from the same problem unless steps are taken to mitigate it. In the horizontally-opposed flat-6 layout the rocking motions of the two straight cylinder banks offset each other, while in the inline-6 layout, the two ends of engine are mirror images of each other and compensate every rocking motion. Concentrating on the first order rocking motion, the V6 can be assumed to consist of two separate straight-3 where counterweights on the crankshaft and a counter rotating balancer shaft compensate the first order rocking motion. At mating, the angle between the banks and the angle between the crankshafts can be varied so that the balancer shafts cancel each other 90° V6 (larger counter weights) and the even firing 60° V6 with 60° flying arms (smaller counter weights. The second order rocking motion can be balanced by a single co-rotating balancer shaft.). This is almost the same technique which balances an even firing 90° crossplane V8 in primary and secondary order. A 90° V8 is in primary balance because each 4-cylinder bank is in primary balance, and the secondary of the two banks can be made to cancel each other using a crossplane. However, there is no equivalent of the crossplane crankshaft for the V6, so that the vibrations from the two banks cannot be made to completely cancel each other. This makes designing a smooth V6 engine a much more complicated problem than the straight-6, flat-6, and V8 layouts. Although the use of offset crankpins, counterweights, and flying arms has reduced the problem to a minor second-order vibration in modern designs, all V6s can benefit from the addition of auxiliary balance shafts to make them completely smooth. When Lancia pioneered the V6 in 1950, they used a 60° angle between the cylinder banks and a six-throw crankshaft to achieve equally spaced firing intervals of 120°. This still has some balance and secondary vibration problems. When Buick designed a 90° V6 based on their 90° V8, they initially used a simpler three-throw crankshaft laid out in the same manner as the V8 with pairs of connecting rods sharing the same crankpin, which resulted in firing intervals alternating between 90° and 150°. This produced a rough-running design which was unacceptable to many customers. Later, Buick and other manufacturers refined the design by using a split-pin crankshaft which achieved a regular 120° firing interval by staggering adjacent crankpins by 15° in opposite directions to eliminate the uneven firing and make the engine reasonably smooth. Some manufacturers such as Buick in later versions of their V6 and Mercedes Benz have taken the 90° design a step further by adding a balancing shaft to offset the primary vibrations and produce an almost fully balanced engine. Some designers have reverted to a 60° angle between cylinder banks, which produces a more compact engine, but have used three-throw crankshafts with flying arms between the crankpins of each throw to achieve even 120° angles between firing intervals. This has the additional advantage that the flying arms can be weighted for balancing purposes. This still leaves an unbalanced primary couple, which is offset by counterweights on the crankshaft and flywheel to leave a small secondary couple, which can be absorbed by carefully designed engine mounts. Six-cylinder designs are also more suitable for larger displacement engines than four-cylinder ones because power strokes of pistons overlap. In a four-cylinder engine, only one piston is on a power stroke at any given time. Each piston comes to a complete stop and reverses direction before the next one starts its power stroke, which results in a gap between power strokes and noticeable vibrations. In a six-cylinder engine (other than odd-firing V6s), the next piston starts its power stroke 60° before the previous one finishes, which results in smoother delivery of power to the flywheel. In addition, because inertial forces are proportional to piston displacement, high-speed six-cylinder engines will suffer less stress and vibration per piston than an equal displacement engine with fewer cylinders. Comparing engines on the dynamometer, a typical even-fire V6 shows instantaneous torque peaks of 150% above mean torque and valleys of 125% below mean torque, with a small amount of negative torque (engine torque reversals) between power strokes. On the other hand, a typical four-cylinder engine' shows peaks of nearly 300% above mean torque and valleys of 200% below mean torque, with 100% negative torque being delivered between strokes. In contrast, a V8 engine shows peaks of less than 100% above and valleys of less than 100% below mean torque, and torque never goes negative. The even-fire V6 thus ranks between the four and the V8, but closer to the V8, in smoothness of power delivery. An odd-fire V6, on the other hand, shows highly irregular torque variations of 200% above and 175% below mean torque, which is significantly worse than an even-fire V6, and in addition the power delivery shows large harmonic vibrations that have been known to destroy the dynamometer. The most efficient cylinder bank angle for a V6 is 60 degrees, minimizing size and vibration. While 60° V6 engines are not as well balanced as inline-6 and flat-6 engines, modern techniques for designing and mounting engines have largely disguised their vibrations. Unlike most other angles, 60 degree V6 engines can be made acceptably smooth without the need for balance shafts. When Lancia pioneered the 60° V6 in 1950, a 6-throw crankshaft was used to give equal firing intervals of 120°. However, more modern designs often use a 3-throw crankshaft with what are termed flying arms between the crankpins, which not only give the required 120° separation but also can be used for balancing purposes. Combined with a pair of heavy counterweights on the crankshaft ends, these can eliminate all but a modest secondary imbalance which can easily be damped out by the engine mounts. This configuration is a good fit in cars which are too big to be powered by four-cylinder engines, but for which compactness and low cost are important. The most common 60° V6s were built by General Motors (the heavy duty commercial models, as well as a design used in many GM front wheel drive cars) and Ford European subsidiaries (Essex V6, Cologne V6 and the more recent Duratec V6). Other 60° V6 engines are the Chrysler 3.3 V6 engine, Nissan VQ engine and the Alfa Romeo V6 engine. 90-degree V6 engines are also produced, usually so they can use the same production-line tooling set up to produce V8 engines (which normally have a 90-degree V angle). Although it is relatively easy to derive a 90-degree V6 from an existing V8 design by simply cutting two cylinders off the engine, this tends to make it wider and more vibration-prone than a 60-degree V6. The design was first used by Buick when it introduced its 198 CID Fireball V6 as the standard engine in the 1962 Special. Other examples include the Maserati V6 used in the Citroën SM, the PRV V6, Chevrolet's 4.3 L Vortec 4300 and Chrysler's 3.9 L (238 cu in) Magnum V6 and 3.7 L (226 cu in) PowerTech V6. The Buick V6 was notable because it introduced the concept of uneven firing, as a result of using the 90 degree V8 cylinder angle without adjusting the crankshaft design for the V6 configuration. These engines were often referred to by mechanics as "shakers," due to the tendency of the engine to bounce around at idle speed. More modern 90-degree V6 engine designs avoid these vibration problems by using crankshafts with offset split crankpins to make the firing intervals even, and often add balancing shafts to eliminate the other vibration problems. Examples include the later versions of the Buick V6 and the 90-degree Mercedes-Benz V6 which, although designed to be built on the same assembly lines as the V8, uses split crankpins, a counter-rotating balancing shaft, and careful acoustic design to make it as smooth and quiet as the inline-6 it replaced. 120 degrees might be described as the natural angle for a V6 since the cylinders fire every 120 degrees of crankshaft rotation. Unlike the 60 degree or 90 degree configuration, it allows pairs of pistons to share crank pins in a three-throw crankshaft without requiring flying arms or split crankpins to be even-firing. However, unlike the crossplane crankshaft V8, there is no way to arrange a V6 so that unbalanced forces from the two cylinder banks will completely cancel each other. As a result, the 120° V6 acts like two straight-3s running on the same crankshaft and, like the straight-3, suffers from a primary dynamic imbalance which requires a balance shaft to offset. The 120° layout also produces an engine which is too wide for most automobile engine compartments, so it is more often used in racing cars where the car is designed around the engine rather than vice-versa, and vibration is not as important. By comparison, the 180° flat-6 boxer engine is only moderately wider than the 120° V6, and unlike the V6 is a fully-balanced configuration with no vibration problems, so it is more commonly used in aircraft and in sports/luxury cars where space is not a constraint and smoothness is important. Ferrari introduced a very successful 120° V6 racing engine in 1961. The Ferrari Dino 156 engine was shorter and lighter than the 65° Ferrari V6 engines that preceded it, and the simplicity and low center of gravity of the engine was an advantage in racing. It won a large number of Formula One races between 1961 and 1964. However, Enzo Ferrari had a personal dislike of the 120° V6 layout, preferring a 65° angle, and after that time it was replaced by other engines. Bombardier has designed 120° V220/V300T V6 engines for use in light aircraft. The ignition sequence is symmetrical, with each cylinder firing 120 degree after the previous cylinder resulting in smooth power delivery. A balance shaft on the bottom of the engine offsets the primary dynamic imbalance intrinsic in any V6 layout. The straight, pin-type crankshaft journals in the 120° V-6 layout allow a shorter and stiffer crankshaft than competing flat-6 engines, while water cooling results in better temperature control than air cooling. These engines have the additional advantage that they can run on automotive gasoline rather than avgas, but have been produced only in limited quantities to date. The 10.6° and 15° Volkswagen VR6, which is such a narrow angle it can use a single cylinder head and double overhead camshafts for both cylinder banks. With 7 main bearings, it is more like a staggered-bank in-line six rather than a normal V6, but is only slightly longer and wider than a straight-4. The 45° Electro-Motive 6 cylinder version of their model 567 Diesel locomotive engine. The 65° Ferrari Dino V6. A 60° angle limited the size of the carburetors which originally used in the engine, while a 65° angle allowed larger carburetors at the expense of a slight increase in vibrations. The 75° Isuzu Rodeo and Isuzu Trooper V6 of 3.2 and 3.5 liters in both SOHC and DOHC versions. Many older V6 engines were based on V8 engine designs, in which a pair of cylinders was cut off the front of V8 without altering the V angle or using a more sophisticated crankshaft to even out the firing interval. Most V8 engines share a common crankpin between opposite cylinders in each bank, and a 90° V8 crankshaft has just four pins shared by eight cylinders, with two pistons per crankpin, allowing a cylinder to fire every 90° to achieve smooth operation. Early 90° V6 engines derived from V8 engines had three shared crankpins arranged at 120° from each other, similar to an inline 3-cylinder. Since the cylinder banks were arranged at 90° to each other, this resulted in a firing pattern with groups of two cylinders separated by 90° of rotation, and groups separated by 150° of rotation, causing a notorious odd-firing behavior, with cylinders firing at alternating 90° and 150° intervals. The uneven firing intervals resulting in rough-running engines with unpleasant harmonic vibrations at certain engine speeds. More modern 90° V6 engines avoid this problem by using split crankpins, with adjacent crankpins offset by 15° in opposite directions to achieve an even 120° ignition pattern. Such a 'split' crankpin is weaker than a straight one, but modern metallurgical techniques can produce a crankshaft that is adequately strong. In 1977, Buick introduced the new "split-pin crankshaft" in the 231. Using a crankpin that is 'split' and offset by 30° of rotation resulted in smooth, even firing every 120°. However, in 1978 Chevrolet introduced a 90° 200/229 V6, which had a compromise 'semi-even firing' design using a crankpin that was offset by only 18°. This resulted in cylinders firing at 108° and 132°, which had the advantage of reducing vibrations to a more acceptable level and did not require strengthening the crankshaft. In 1985 Chevrolet's 4.3 (later the Vortec 4300) changed it to a true even-firing V6 with a 30° offset, requiring larger crank journals to make them adequately strong. In 1986 the similarly-designed 90° PRV engine adopted the same 30° crankshaft offset design to even out its firing. In 1988, Buick introduced a V6 engine that not only had split crankpins, but had a counter-rotating balancing shaft between the cylinder banks to eliminate almost all primary and secondary vibrations, resulting in a very smooth-running engine. The V6 engine was introduced into racing by Lancia in the early '50s. After good results with privately entered Aurelia saloons Lancia set a works competition department in 1951. Four B20 Coupes were entered in the '51 Mille Miglia and the one driven by Giovanni Bracco and Umberto Maglioli caused quite a stir by finishing second overally after the 4.1-litre Ferrari driven by Villoresi and Cassani, a car which three times more power than the Lancia. After that encouraging start Lancia decided to carry on with the endurance racing program, first with specially prepared Aurelias (called Da Corsa) and then with specially built prototypes. A D24 with a 3,102 cc (189 cu in) V6 making 230 PS (170 kW) won the 1953 Carrera Panamericana with Juan Manuel Fangio at the wheel. After that came the Ferrari Dino V6. Alfredo Ferrari (nicknamed Dino), son of Enzo Ferrari, suggested to him the development of a 1.5 L DOHC V6 engine for Formula Two at the end of 1955. The Dino V6 underwent several evolutions, including an increased engine displacement to 2,417 cc (147 cu in), for use in the Ferrari 246 Formula One car in 1958. The use of a wide 120° bank angle is appealing for racing engine designers as it permits a low center of gravity. This design is even considered superior to the flat-6 in that it leaves more space under the engine for exhaust pipes; thus the crankshaft can be placed lower in the car. The Ferrari 156 built for new Formula One 1.5 L regulations used a Dino V6 engine with this configuration. The Dino V6 engine saw a new evolution in 1966 when it was adapted to road use and produced by a Ferrari-Fiat joint-venture for the Fiat Dino and Dino 206 GT (this car was made by Ferrari but sold under the brand Dino). This new version was redesigned by Aurelio Lampredi initially as a 65° 2.0 L (~122 cu in) V6 with an aluminum block but was replaced in 1969 by a 2.4 L (~146 cu in) cast-iron block version (the Dino car was renamed the 246GT). The Fiat Dino and Dino 246GT were phased out in 1974, but 500 engines among the last built were delivered to Lancia, who was like Ferrari already under the control of Fiat. Lancia used them for the Lancia Stratos which would become one of the most successful rally cars of the decade. The Alfa Romeo V6 was designed in the 1970s by Giuseppe Busso, the first car to use them being the Alfa Romeo 6. The over-square V6, with aluminium alloy block and heads, has seen continuous use in road vehicles, from the Alfetta GTV6 onwards. A notable use of the Bussone Sei (Busso's big Six) V6 was the Alfa Romeo 155 V6 TI. Turbocharged, it had a peak power of 490 PS (360 kW; 480 hp) at 11,900 rpm. The 164 introduced a 3.0 L (~183 cu in) V6, a 2.0 V6 turbocharged in 1991 and in 1992, a 3.0 L DOHC 24 valve version. The Alfa 156 introduced a 2.5 L DOHC 24 valve version in 1997. The engine capacity was later increased to 3.2 L (~195 cu in), where it found application in the 156 GTA, 147 GTA, 166, GT, GTV and Spider 916. Production was discontinued in 2005. Ferrari followed Renault in the turbo revolution by introducing a turbocharged derivative of the Dino design (a 1.5 L 120° V6) with the Ferrari 126. However, the 120° design was not considered optimum for the wing cars of the era and later engines used V angles of 90° or less. Both Renault and Ferrari failed in their attempt to win the Drivers' Championship with V6 Turbo engines. The first turbocharged engine to win the championship was the Straight-4 BMW. They were followed by a new generation of Formula One engines, the most successful of these being the TAG V6 (designed by Porsche) and the Honda V6. This new generation of engines were characterized by odd V angles (around 80°). The choice of these angles was mainly driven by aerodynamic consideration. Despite their unbalanced designs these engines were both quickly reliable and competitive; this is generally viewed as a consequence of the quick progress of CAD techniques in that era. In 1989 Shelby tried to bring back the Can-Am series, using the Chrysler 3.3 L (201 cu in) V6 (not yet offered to the general public) as the powerplant in a special racing configuration making 255 hp (190 kW). This was the same year that the Viper concept was showed to the public. Originally the plan was to produce two versions of this race car, a 255 hp (190 kW) version and a 500 hp (370 kW) model, the 255 horsepower (190 kW) version being the entry circuit. The cars were designed to be a cheap way for more people to enter auto racing. Since all the cars were identical, the winners were to be the people with the best talent, not the team with the biggest pockets. The engines had Shelby seals on them and could only be repaired by Shelby's shop, ensuring that all the engines are mechanically identical. Only 100 of these 3.3s were ever built. Of these 100, 76 were put into Shelby Can-Am cars (the only 76 that were ever sold). No significant amount of spare parts were produced, and the unsold engines were used for parts/spares. The Shelby specific parts, such as the upper intake manifold, were never made available to the general public. According to a small article in the USA Today (in 1989), these cars were making 250 hp (190 kW) [stock versions introduced in 1990 produced 150 hp) and hitting 160 mph (260 km/h) on the track. The engine itself was not that far from a standard-production 3.3. The Shelby engine is only making about 50 horsepower (37 kW) more than the newest 3.3 factory engines from Chrysler. The Can-Am engine has a special Shelby Dodge upper intake manifold, a special Shelby Dodge throttle body, and a special version of the Mopar 3.3 PCM (which had this engine redlining at 6800 rpm). Nissan also has a quite successful history of using V6's for racing in both IMSA and the JGTC. Development of their V6s for sports cars began in the early 1980s with the VG engine initially used in the Z31 300ZX. The engine began life as a SOHC, turbocharged 3.0L power plant with electronic fuel injection, delivering 230 PS (169 kW). The VG30ET was later revised into the VG30DETT for the Z32 300ZX in 1989. The VG30DETT sported both an additional turbocharger and an extra pair of camshafts, making the engine a genuine DOHC twin-turbo V6 producing 300 PS (221 kW). Nissan used both of these engines in its IMSA racing program through out the 1980s and 1990s each producing well over 800 hp (600 kW). In the Japan Grand Touring Car Championship, or JGTC, Nissan opted for a turbocharged version of its VQ30 making upwards of 500 hp (370 kW) to compete in the GT500 class. Laverda showed a 996 cc V6 engined motorcycle at the 1977 Milan show. The motorcycle was raced in the 1978 Bol d'Or. Borgeson, Griffith (1998). The Golden Age of the American Racing Car (2nd ed.). Society of Automotive Engineers. ISBN 0-7680-0023-8. Box, Rob De La Rive (1998). The Complete Encyclopedia of Vintage Cars 1886 - 1940 (3rd ed.). Rebo Productions. ISBN 9-0366-1517-8. Kane, Jack (2006). "Torsional Output of Piston Engines". 2006 Advanced Engine Technology Conference (AETC): EPI, Inc.. http://www.epi-eng.com/ET-PistonExcit.htm. Retrieved 2008-01-14. Ludvigsen, Karl (2001). Classic Racing Engines. Haynes Publishing. ISBN 1-85960-649-1. Matschoss, Conrad (1921). Geschichte der Gasmotorenfabrik Deutz. Berlin. Nunney, M J (2007). Light and Heavy Vehicle Technology (4th ed.). Butterworth-Heinemann. ISBN 0-7506-8037-7. This page was last modified on 1 June 2010 at 12:33. Go here for a discussion of the inline six engine. air/fuel mixture or ratio (a richer mixture for power and a leaner mixture for economy) is ignited by the ignition system at the correct time. In this way, all the energy of the richer air/fuel mixture is converted to power; similarly, the leaner mixture gains fuel economy because its charge is burned completely. A high-performance engine will only perform at its best when the initial timing and the ignition advance curve are tailored to suit the engine, the fuel, the owner’s driving style, usage, etc. High-performance carburetors, intake manifolds, cylinder heads, camshafts, and other tuning components are all dependent upon correct ignition timing; if the spark is not delivered at the proper time to the combustion chamber, the quest for power or economy is for nothing. "Oxyacetylene" redirects here. For the song, see Cubanate. Oxy-fuel welding (commonly called oxyacetylene welding, oxy welding, or gas welding in the U.S.) and oxy-fuel cutting are processes that use fuel gases and oxygen to weld and cut metals, respectively. French engineers Edmond Fouche and Charles Picard became the first to develop an oxygen-acetylene welding set-up in 1903. Pure oxygen, instead of air (20% oxygen/80% nitrogen), is used to increase the flame temperature to allow localized melting of the workpiece material (e.g. steel) in a room environment. A common propane/air flame burns at about 2,000°C, a propane/oxygen flame burns at about 2,500°C, and an acetylene/oxygen flame burns at about 3,500°C. Since iron melts at about 1,500°C (high carbon steel at about 1,150°C), air flames can achieve melting only in a specialized insulated furnace. Small, high-flow, oxygen flames provide enough heat flow to locally exceed the melting point in a large workpiece (e.g. sheet). Oxy-fuel is one of the oldest welding processes, though in recent years it has become less popular in industrial applications. However, it is still widely used for welding pipes and tubes, as well as repair work. It is also frequently well-suited, and favored, for fabricating some types of metal-based artwork. In oxy-fuel welding, a welding torch is used to weld metals. Welding metal results when two pieces are heated to a temperature that produces a shared pool of molten metal. The molten pool is generally supplied with additional metal called filler. Filler material depends upon the metals to be welded. In oxy-fuel cutting, a cutting torch is used to heat metal to kindling temperature. A stream of oxygen is then trained on the metal, and metal burns in that oxygen and then flows out of the cut (kerf) as an oxide slag . Torches that do not mix fuel with oxygen (combining, instead, atmospheric air) are not considered oxy-fuel torches and can typically be identified by a single tank (Oxy-fuel welding/cutting generally requires two tanks, fuel and oxygen). Most metals cannot be melted with a single-tank torch. As such, single tank torches are typically used only for soldering and brazing, rather than welding. In Stone Work for "flaming" where the stone is heated and a top layer crackles and breaks. A steel circular brush is attached to an angle grinder and used to remove the first layer leaving behind a bumpy surface similar to hammered bronze. In the glass industry for "fire polishing". In jewelry production for "water welding" using a water torch. Formerly, to heat lumps of quicklime to obtain a bright white light called limelight, in theatres or optical ("magic") lanterns. Formerly, in platinum works, as platinum is only fusible in the oxy-hydrogen flame and in an electric furnace. In short, oxy-fuel equipment is quite versatile – not only because it is preferred for some sorts of iron or steel welding but also because it lends itself to brazing, braze-welding, metal heating (for annealing or tempering, bending or forming), the loosening of corroded nuts and bolts, and also is the ubiquitous means for oxy-fuel cutting of ferrous metals. The apparatus used in gas welding consists basically of an oxygen source and a fuel gas source (usually cylinders), two pressure regulators and two flexible hoses (one of each for each cylinder), and a torch. This sort of torch can also be used for soldering and brazing. The cylinders are often carried in a special wheeled trolley. There have been examples of oxyhydrogen cutting sets with small (scuba-sized) gas cylinders worn on the user's back in a backpack harness, for rescue work and similar. There are also examples of pressurized liquid fuel cutting torches, usually using gasoline. These are used for their increased portability. The regulator is used to control pressure from the tanks to the required pressure in the hose. The flow rate is then adjusted by the operator using needle valves on the torch. Accurate flow control with a needle valve relies on a constant inlet pressure to it. Most regulators have two stages: the first stage of the regulator is a fixed-pressure regulator whose function is to release the gas from the cylinder at a constant intermediate pressure, despite the pressure in the cylinder falling as the gas in the cylinder is used. This is similar to the first stage of a scuba-diving regulator. The adjustable second stage of the regulator controls the pressure reduction from the intermediate pressure to the low outlet pressure. The regulator has two pressure gauges, one indicating cylinder pressure, the other indicating hose pressure. The adjustment knob of the regulator is sometimes roughly calibrated for pressure, but an accurate setting requires observation of the gauge. Some simpler or cheaper oxygen-fuel regulators have only a single stage regulator, or only a single gauge. A single-stage regulator will tend to reduce its outlet pressure as the cylinder is emptied, requiring manual readjustment. For low-volume users, this is an acceptable simplification. Welding regulators, unlike simpler LPG heating regulators, retain their outlet (hose) pressure gauge and do not rely on the calibration of the adjustment knob. The cheaper single-stage regulators may sometimes omit the cylinder contents gauge, or replace the accurate dial gauge with a cheaper and less precise "rising button" gauge. The hoses are specifically designed for welding and cutting. The hose is usually a double-hose design, meaning that there are two hoses joined together. The oxygen hose is green and the fuel hose is red. The type of gas the hose will be carrying is important because the connections will have different threads for different types of gas. Fuel gases (red) will use left-hand threads and a groove cut into the nut, while the oxygen (green) will use right-hand threads. This is a safety precaution to prevent hoses from being hooked up the wrong way. There are basically two types of connections that can be used. The first is using a jubilee clip. The second option is using a crimped connector. The second option is probably safer as it is harder for this type of connection to come loose. The hoses should also be clipped together at intervals approximately 3 feet apart. Between the regulator and hose, and ideally between hose and torch on both oxygen and fuel lines, a flashback arrestor and/or non-return valve (check valve) should be installed to prevent flame or oxygen-fuel mixture being pushed back into either cylinder and damaging the equipment or making a cylinder explode. European practice is to fit flashback arrestors at the regulator and check valves at the torch. US practice is to fit both at the regulator. The flashback arrestor (not to be confused with a check valve) prevents the shock waves from downstream coming back up the hoses and entering the cylinder (possibly rupturing it), as there are quantities of fuel/oxygen mixtures inside parts of the equipment (specifically within the mixer and blowpipe/nozzle) that may explode if the equipment is incorrectly shut down; and acetylene decomposes at excessive pressures or temperatures. The flashback arrestor will remain switched off until someone resets it, in case the pressure wave created a leak downstream of the arrestor. A check valve lets gas flow in one direction only. Not to be confused with a flashback arrestor, a check valve is not designed to block a shock wave. The pressure wave could occur while the ball is so far from the inlet that the pressure wave gets past before the ball reaches its off position. A check valve is usually a chamber containing a ball that is pressed against one end by a spring: gas flow one way pushes the ball out of the way, and no flow or flow the other way lets the spring push the ball into the inlet, blocking it. The torch is the part that the welder holds and manipulates to make the weld. It has a connection and valve for the fuel gas and a connection and valve for the oxygen, a handle for the welder to grasp, a mixing chamber (set at an angle) where the fuel gas and oxygen mix, with a tip where the flame forms. A welding torch head is used to weld metals. It can be identified by having only one or two pipes running to the nozzle and no oxygen-blast trigger and two valve knobs at the bottom of the handle letting the operator adjust the oxygen flow and fuel flow. A cutting torch head is used to cut materials. It is similar to a welding torch, but can be identified by the oxygen blow out trigger or lever. The metal is first heated by the flame until it is cherry red. Once this temperature is attained, oxygen is supplied to the heated parts by pressing the "oxygen-blast trigger". This oxygen reacts with the metal, forming iron oxide and producing heat. It is this heat which continues the cutting process. The cutting torch only heats the metal to start the process; further heat is provided by the burning metal. The melting point of the iron oxide is around half of that of the metal; as the metal burns, it immediately turns to liquid iron oxide and flows away from the cutting zone. However, some of the iron oxide remains on the work piece, forming a hard "slag" which can be removed by gentle tapping, and/or a grinder. A rose-bud torch is used to heat metals for bending, straightening, etc. where a large area needs to be heated. It is called as such because the flame at the end looks like a rose-bud. A welding torch can also be used to heat small area such as rusted nuts and bolts. In this case, no filler rod is used with the torch. A typical Oxy-fuel torch, called an equal-pressure torch, merely mixes the two gasses. In an injector torch, high pressure oxygen comes out of a small nozzle inside the torch head so that it drags the fuel gas along with it, via venturi effect. Oxy-fuel processes may use a variety of fuel gases, the most common being acetylene. Other gases that may be used are propylene, liquified petroleum gas (LPG), propane, natural gas, hydrogen, and MAPP gas. Many brands use different kinds of gases in their mixes. Note: there is not a single gas called "oxyacetylene". Acetylene generator as used in Bali by a reaction of calcium carbide with water. This is used where acetylene cylinders are not available. 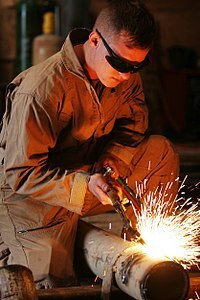 The term 'Las Karbit' means acetylene (carbide) welding in Indonesian. Acetylene is the primary fuel for oxy-fuel welding and is the fuel of choice for repair work and general cutting and welding. Acetylene gas is shipped in special cylinders designed to keep the gas dissolved. The cylinders are packed with porous materials (e.g. kapok fibre, diatomaceous earth, or (formerly) asbestos), then filled to around 50% capacity with acetone, as acetylene is acetone soluble. This method is necessary because above 207 kPa (30 lbf/in²) (absolute pressure) acetylene is unstable and may explode. There is about 1700 kPa (250 psi) pressure in the tank when full. Acetylene when combined with oxygen burns at a temperature of 3200 °C to 3500 °C (5800 °F to 6300 °F), highest among commonly used gaseous fuels. As a fuel acetylene's primary disadvantage, in comparison to other fuels, is high cost. As acetylene is unstable at a pressure roughly equivalent to 33 feet/10 meters underwater, water submerged cutting and welding is reserved for hydrogen rather than acetylene. Compressed gas cylinders containing oxygen and MAPP gas. Oxy-gasoline, also known as oxy-petrol, torches have been found to perform very well, especially where bottled gas fuel is not available or difficult to transport to the worksite. Tests showed that an oxy-gasoline torch cut steel plate up to 0.5 inch thick as well as oxyacetylene; and 0.5 to 4 inches thick better: 3 times better at 4 inches thick. The gasoline is fed from a pressure tank whose pressure can be hand-pumped or fed from a gas cylinder. Another low cost approach commonly used by jewelry makers in Asia is using air bubbled through a gasoline container by a foot-operated air pump, and burning the fuel-air mixture in a specialized welding torch. Hydrogen has a clean flame and is good for use on aluminium. It can be used at a higher pressure than acetylene and is therefore useful for underwater welding and cutting. It is a good type of flame to use when heating large amounts of material. The flame temperature is high, about 2,000 °C for hydrogen gas in air at atmospheric pressure, and up to 2800 °C when pre-mixed in a 2:1 ratio with pure oxygen (oxyhydrogen). The oxygen and the hydrogen are led off the electrolysis cell separately and are fed into the two gas connections of an ordinary oxy-gas torch. This happens in the water torch, which is sometimes used in small torches used in making jewelry and electronics. The mixed oxygen and hydrogen are drawn from the electrolysis cell and are led into a special torch designed to prevent flashback. See oxyhydrogen. MAPP gas is a registered product of the Dow Chemical Company. It is liquefied petroleum gas mixed with methylacetylene-propadiene. It has the storage and shipping characteristics of LPG and has a heat value a little less than acetylene. Because it can be shipped in small containers for sale at retail stores, it is used by hobbyists and large industrial companies and shipyards because it does not polymerize at high pressures - above 15 psi or so (as acetylene does) and is therefore much less dangerous than acetylene. Further, more of it can be stored in a single place at one time, as the increased compressability allows for more gas to be put into a tank. MAPP gas can be used at much higher pressures than acetylene, sometimes up to 40 or 50 psi in high-volume oxy-fuel cutting torches which can cut up to 12 inch thick steel. Other welding gases that develop comparable temperatures need special procedures for safe shipping and handling. A MAPP gas leak is easy to identify because of its particularly terrible odor. MAPP is recommended for cutting applications in particular, rather than welding applications. Butane, like propane, is a saturated hydrocarbon. Butane and propane do not react with each other and are regularly mixed together. Butane boils at 0.6 deg C. Propane is more volatile, with a boiling point of - 42 deg C. Vaporization is rapid at temperatures above the boiling points. The calorific (heat) values of both are almost equal. Both are thus mixed together to attain the vapor pressure that is required by the end user and depending on the ambient conditions. If the ambient temperature is very low propane is preferred to achieve higher vapor pressure at the given temperature.Propane does not burn as hot as acetylene in its inner cone, and so it is rarely used for welding. Propane, however, has a very high number of BTUs per cubic foot in its outer cone, and so with the right torch (injector style) can make a faster and cleaner cut than acetylene, and is much more useful for heating and bending than acetylene. Propane is cheaper than acetylene and easier to transport. Like propylene, most propane tips are of a two piece design. Propane often gets unfair criticism because it really needs changing your torch (from an equal pressure torch to an injector torch) and not just changing your tip to get the best performance. Most torches are equal pressure and designed for gases such as acetylene which are lighter than oxygen. Propane is a great deal heavier and runs much better through a low-pressure injector torch with a setting from a few ounces to about two pounds per square inch when cutting. Propylene is used in production welding and cutting. It cuts similarly to propane. When propylene is used, the torch rarely needs tip cleaning. There is often a substantial advantage to cutting with an injector torch (see the propane section) rather than an equal-pressure torch when using propylene. Oxygen is not the fuel. It is what chemically combines with the fuel to produce the heat for welding. This is called 'oxidation', but the more specific and more commonly used term in this context is 'combustion'. In the case of hydrogen, the product of combustion is simply water. For the other hydrocarbon fuels, water and carbon dioxide are produced. The heat is released because the molecules of the products of combustion have a lower energy state than the molecules of the fuel and oxygen. In oxy-fuel cutting, oxidation of the metal being cut (typically iron) produces nearly all of the heat required to "burn" through the workpiece. The word "oxygen" is often shortened to 'oxy', as in the term 'oxy-acetylene torch'. Oxygen is usually produced elsewhere by distillation of liquified air and shipped to the welding site in high pressure vessels (commonly called "tanks" or "cylinders") at a pressure of about 21000 kPa (3000 lbf/in² = 200 atmospheres). It is also shipped as a liquid in Dewar type vessels (like a large Thermos jar) to places that use large amounts of oxygen. It is also possible to separate oxygen from air by passing the air, while under pressure, through a zeolite sieve which selectively absorbs the nitrogen and lets the oxygen (and argon) pass. This gives a purity of oxygen of about 93%. This works well for brazing. The welder can adjust the oxy-acetylene flame to be carbonizing (aka reducing), neutral, or oxidizing. Adjustment is made by adding more or less oxygen to the acetylene flame. The neutral flame is the flame most generally used when welding or cutting. The welder uses the neutral flame as the starting point for all other flame adjustments because it is so easily defined. This flame is attained when welders, as they slowly open the oxygen valve on the torch body, first see only two flame zones. At that point, the acetylene is being completely burned in the welding oxygen and surrounding air . The flame is chemically neutral. The two parts of this flame are the light blue inner cone and the darker blue to colorless outer cone. The inner cone is where the acetylene and the oxygen combine. The tip of this inner cone is the hottest part of the flame. It is approximately 6,000 °F (3,300 °C) and provides enough heat to easily melt steel . In the inner cone the acetylene breaks down and partly burns to hydrogen and carbon monoxide, which in the outer cone combine with more oxygen from the surrounding air and burn. An excess of acetylene creates a carbonizing flame. This flame is characterized by three flame zones; the hot inner cone, a white-hot "acetylene feather", and the blue-colored outer cone. This is the type of flame observed when oxygen is first added to the burning acetylene. The feather is adjusted and made ever smaller by adding increasing amounts of oxygen to the flame. A welding feather is measured as 2X or 3X, with X being the length of the inner flame cone. The unburned carbon insulates the flame and drops the temperature to approximately 5,000 °F (2,800 °C). The reducing flame is typically used for hardfacing operations or backhand pipe welding techniques. The feather is caused by incomplete combustion of the acetylene to cause an excess of carbon in the flame. Some of this carbon is dissolved by the molten metal to carbonize it. The carbonizing flame will tend to remove the oxygen from iron oxides which may be present, a fact which has caused the flame to be know as a "reducing flame" . The size of the flame can be adjusted to a limited extent by the valves on the torch and by the regulator settings, but in the main it depends on the size of the orifice in the tip. In fact, the tip should be chosen first according to the job at hand, and then the regulators set accordingly. The flame is applied to the base metal and held until a small puddle of molten metal is formed. The puddle is moved along the path where the weld bead is desired. Usually, more metal is added to the puddle as it is moved along by means of dipping metal from a welding rod or filler rod into the molten metal puddle. The metal puddle will travel towards where the metal is the hottest. This is accomplished through torch manipulation by the welder. The amount of heat applied to the metal is a function of the welding tip size, the speed of travel, and the welding position. The flame size is determined by the welding tip size. The proper tip size is determined by the metal thickness and the joint design. Welding gas pressures using oxy-acetylene are set in accordance with the manufacturer's recommendations. The welder will modify the speed of welding travel to maintain a uniform bead width. Uniformity is a quality attribute indicating good workmanship. Trained welders are taught to keep the bead the same size at the beginning of the weld as at the end. If the bead gets too wide, the welder increases the speed of welding travel. If the bead gets too narrow or if the weld puddle is lost, the welder slows down the speed of travel. Welding in the vertical or overhead positions is typically slower than welding in the flat or horizontal positions. The welder must add the filler rod to the molten puddle. The welder must also keep the filler metal in the hot outer flame zone when not adding it to the puddle to protect filler metal from oxidation. Do not let the welding flame burn off the filler metal. The metal will not wet into the base metal and will look like a series of cold dots on the base metal. There is very little strength in a cold weld. When the filler metal is properly added to the molten puddle, the resulting weld will be stronger than the original base metal. For cutting, the set-up is a little different. A cutting torch has a 60 or 90-degree angled head with orifices placed around a central jet. The outer jets are for preheat flames of oxygen and acetylene. The central jet carries only oxygen for cutting. The use of a number of preheating flames, rather than a single flame makes it possible to change the direction of the cut as desired without changing the position of the nozzle or the angle which the torch makes with the direction of the cut, as well as giving a better preheat balance . Manufacturers have developed custom tips for Mapp, propane, and polypropylene gases to optimize the flames from these alternate fuel gases. The flame is not intended to melt the metal, but to bring it to its ignition temperature. The torch's trigger blows extra oxygen at higher pressures down the torch's third tube out of the central jet into the workpiece, causing the metal to burn and blowing the resulting molten oxide through to the other side. The ideal kerf is a narrow gap with a sharp edge on either side of the workpiece; overheating the workpiece and thus melting through it causes a rounded edge. Cutting a rail just before renewing the rails and the ballast. Cutting is initiated by heating the edge or leading face (as in cutting shapes such as round rod) of the steel to the ignition temperature (approximately bright cherry red heat) using the pre-heat jets only, then using the separate cutting oxygen valve to release the oxygen from the central jet . The oxygen chemically combines with the iron in the ferrous material to instantly oxidize the iron into molten iron oxide, producing the cut. Initiating a cut in the middle of a workpiece is known as piercing. The oxygen flowrate is critical — too little will make a slow ragged cut; too much will waste oxygen and produce a wide concave cut. Oxygen Lances and other custom made torches do not have a separate pressure control for the cutting oxygen, so the cutting oxygen pressure must be controlled using the oxygen regulator. The oxygen cutting pressure should match the cutting tip oxygen orifice. Consult the tip manufacturer's equipment data for the proper cutting oxygen pressures for the specific cutting tip . Since the melted metal flows out of the workpiece, there must be room on the opposite side of the workpiece for the spray to exit. When possible, pieces of metal are cut on a grate that lets the melted metal fall freely to the ground. The same equipment can be used for oxyacetylene blowtorches and welding torches, by exchanging the part of the torch in front of the torch valves. For a basic oxy-acetylene rig, the cutting speed in light steel section will usually be nearly twice as fast as a petrol-driven cut-off grinder. The advantages when cutting large sections are obvious - an oxy-fuel torch is light, small and quiet and needs very little effort to use, whereas a cut-off grinder is heavy and noisy and needs considerable operator exertion and may vibrate severely, leading to stiff hands and possible long-term repetitive strain injury. Oxy-acetylene torches can easily cut through ferrous materials in excess of 50 mm (2 inches). Oxygen Lances are used in scrapping operations and cut sections thicker than 200 mm (8 inches). Cut-off grinders are useless for these kinds of application. Robotic oxy-fuel cutters sometimes use a high-speed divergent nozzle. This uses an oxygen jet that opens slightly along its passage. This allows the compressed oxygen to expand as it leaves, forming a high-velocity jet that spreads less than a parallel-bore nozzle, allowing a cleaner cut. These are not used for cutting by hand since they need very accurate positioning above the work. Their ability to produce almost any shape from large steel plates gives them a secure future in shipbuilding and in many other industries. Oxy-propane torches are usually used for cutting up scrap to save money, as LPG is far cheaper joule-for-joule than acetylene, although propane does not produce acetylene's very neat cut profile. Propane also finds a place in production, for cutting very large sections. Oxy-acetylene can only cut low to medium carbon steels and wrought iron. High carbon steels cannot be cut because the melting point is very close to the temperature of the flame and so the slag from the cutting action does not eject as sparks, but rather mixes with the clean melt near the cut. This keeps the oxygen from reaching the clean metal and burning it. In the case of cast iron graphite between the grains and the shape of the grains themselves interfere with cutting action of torch. More than 1/7 the capacity of the cylinder should not be used per hour. This causes the acetone inside the acetylene cylinder to come out of the cylinder and contaminate the hose and possibly the torch. Acetylene is dangerous above 15 psi pressure. It is unstable and explosively decomposes. Proper ventilation when welding will help to avoid large chemical exposure. Proper protection such as welding goggles should be worn at all times, including to protect the eyes against glare and flying sparks. Special safety eyewear must be used—both to protect the welder and to provide a clear view through the yellow-orange flare given off by the incandescing flux. In the 1940s cobalt melters’ glasses were borrowed from steel foundries and were still available until the 1980s. However, the lack of protection from impact, ultra-violet, infrared and blue light caused severe eyestrain and eye damage. Didymium eyewear, developed for glassblowers in the 1960’s, was also borrowed—until many complained of eye problems from excessive infrared, blue light, and insufficient shading. Today you can find very good eye protection designed especially for gas-welding aluminum that cuts the sodium orange flare completely and provides the necessary protection from ultraviolet, infrared, blue light and impact, according to ANSI Z87-1989 safety standards for a Special Purpose Lens. Fuel gases that are denser than air (Propane, Propylene, MAPP, Butane, etc...), may collect in low areas if allowed to escape. To avoid an ignition hazard, special care should be taken when using these gases over areas such as basements, sinks, storm drains, etc. In addition, leaking fittings may catch fire during use and pose a risk to personnel as well as property. When using fuel and oxygen tanks they should be fastened securely upright to a wall or a post or a portable cart. An oxygen tank is especially dangerous for the reason that the oxygen is at a pressure of 21 MPa (3000 lbf/in² = 200 atmospheres) when full, and if the tank falls over and its valve strikes something and is knocked off, the tank will effectively become an extremely deadly flying missile propelled by the compressed oxygen, capable of even breaking through a brick wall. For this reason, never move an oxygen tank around without its valve cap screwed in place. On oxyacetylene torch system there will be three types of valves, the tank valve, the regulator valve, and the torch valve. There will be a set of these three valves for each gas. The gas in the tanks or cylinders is at high pressure. Oxygen cylinders are generally filled to approximately 2200 psi. The regulator converts the high pressure gas to a low pressure stream suitable for welding. Never attempt to directly use high-pressure gas. A less obvious hazard of welding is exposure to harmful chemicals. Exposure to certain metals, metal oxides, or carbon monoxide can often lead to severe medical conditions. Damaging chemicals can be produced from the fuel, from the work-piece, or from a protective coating on the work-piece. By increasing ventilation around the welding environment, the welders will have much less exposure to harmful chemicals from any source. The most common fuel used in welding is acetylene, which has a two stage reaction. The primary chemical reaction involves the acetylene disassociating in the presence of oxygen to produce heat, carbon monoxide, and hydrogen gas: C2H2 + O2 → 2CO + H2. A secondary reaction follows where the carbon monoxide and hydrogen combine with more oxygen to produce carbon dioxide and water vapor. When the secondary reaction does not burn all of the reactants from the primary reaction, the welding processes produces large amounts of carbon monoxide, and it often does. Carbon monoxide is also the byproduct of many other incomplete fuel reactions. Almost every piece of metal is an alloy of one type or another. Copper, aluminium, and other base metals are occasionally alloyed with beryllium, which is a highly toxic metal. When a metal like this is welded or cut, high concentrations of toxic beryllium fumes are released. Long-term exposure to beryllium may result in shortness of breath, chronic cough, and significant weight loss, accompanied by fatigue and general weakness. Other alloying elements such as arsenic, manganese, silver, and aluminium can cause sickness to those who are exposed. More common are the anti-rust coatings on many manufactured metal components. Zinc, cadmium, and fluorides are often used to protect irons and steels from oxidizing. Galvanized metals have a very heavy zinc coating. Exposure to zinc oxide fumes can lead to a sickness named "metal fume fever". This condition rarely lasts longer than 24 hours, but is still unpleasant. Not unlike common influenza, fevers, chills, nausea, cough, and fatigue are common effects of high zinc oxide exposure. Flashback is the condition of the flame propagating down the hoses of an oxy-fuel welding and cutting system. To prevent such a situation a flashback arrestor is usually employed. The flame burns backwards into the hose, causing a popping or squealing noise. It can cause an explosion in the hose with the potential to injure or kill the operator. Using a lower pressure than recommended can cause a flashback. ^ Carlisle, Rodney (2004). Scientific American Inventions and Discoveries, p.365. John Wiley & Songs, Inc., New Jersey. ISBN 0471244104. ^ William Augustus Tilden. Chemical Discovery and Invention in the Twentieth Century. Adamant Media Corporation. p. 80. ISBN 0543916464. ^ White, Kent. "Authentic Aluminum Gas Welding - The Method Revised." Booklet. Published by TM Technologies. ^ "Air Cylinder Rocket." Mythbusters Discovery Channel, October 18, 2006. ^ Swift, P.; Murray, J. (2008), FCS Welding L2, Pearson South Africa, p. 286, ISBN 9781770252264, http://books.google.com/books?id=pworXllC8OcC&pg=PA286. Miller, Samuel Wylie (1916). Oxy-acetylene Welding. The Industrial press. http://books.google.com/books?id=2ilDAAAAIAAJ. .
Jeffus, Larry F. (1997). Welding: Principles and Applications (4th, illustrated ed.). Cengage Learning. ISBN 9780827382404. http://books.google.com/books?id=iXAmL8HEMfkC. .
Kent White (2008). Authentic Aluminum Gas Welding - The Method Revived. Althouse; Turnquist; Bowditch (1970). Modern Welding. Goodheart-Willcox. The Welding Encyclopedia (ninth ed.). The Welding Engineer staff. 1938. This page was last modified on 13 June 2010 at 16:34.